Software tools to analyze and select energy efficient solar windows. The first three items listed below will allow you to make good window choices for your house and climate. Remember that for good solar passive heating performance, you need to have south facing windows with high Solar Heat Gain Coefficients (SHGC), and you will want to provide a means to prevent unwanted summer heat gain from these windows. Think about thermal (insulating) shades right from the start. Use of good thermal shades can double the performance of a window. Using odd shaped windows can make it difficult to impossible to fit thermal shades. www.efficientwindows.org/index.cfm Very good information on choosing windows for your exposure, climate, aims... Try the "Window Selection Tool", and the "Fact Sheet" for you state. A good, up-to-date, and readable guide on selecting windows. This guide and the Efficient Windows site above should go a long way toward getting the best windows for your situation. If you want to do detailed comparisons of different window types and strategies for your particular house and climate, try the Resfen program just below. U-factor, SHGC, CR, VT, Air Infiltration – What does this stuff mean? This is a pretty good rundown on what the various ratings on windows such as U-factor, SHGC, air infiltration mean, and how they are calculated. Fascinating paper describing in field work done to test for infiltration on existing windows in a Portland historic building. 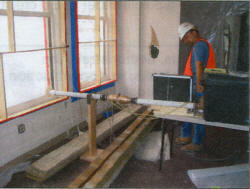 The test shows the test apparatus, and the results for the baseline windows and the improvement for sealing (dramatic). Its interesting that with some fairly simple sealing that very good leakage rates were attained (equivalent to new windows).